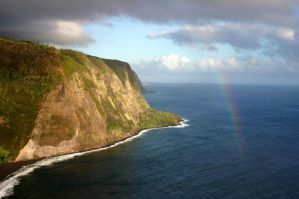 The Big Island of Hawaii has a lot to offer, especially since it's one of the lesser visited islands in the state. With lots of land and beaches, some terrific landscapes, a world-renowned National Park, and various climate and ecological zones, the Big Island has something for everyone. Diving off the coast here is also first rate. Plenty of reefs full of tropical fish in water with great visibility can be found just off of the shore. Sometimes all you need is a snorkel and some fins, because just a few hundred feet from the shore in shallow water there are plenty of underwater attractions. Various hotels and resorts along the western shore offer great diving opportunities on the "dry" side of the island (much of the rain comes from the east and is blocked by the mountains). 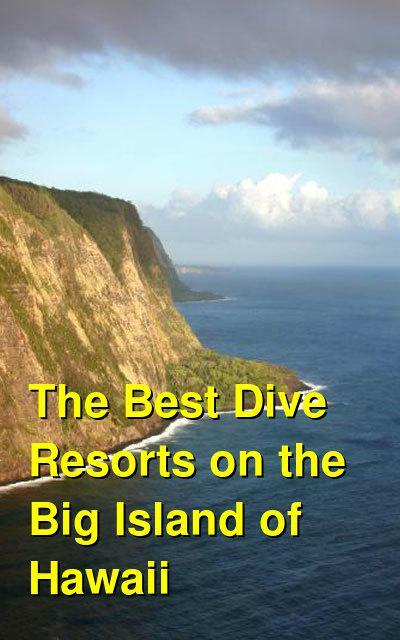 While some of the resorts offer their own diving excursions, others will refer you to nearby day trip boats operating out of the harbors at Kailua Kona, Honokohau Marina, and Hilo. Within walking distance to the shops and restaurants of the town of Kailua-Kona, the Royal Kona Resort provides the best mix of a seaside resort with a convenient location. Sitting on a lava-rock outcropping into the beautiful blue Kailua Bay, this breathtaking resort offers a nice swimming pool, a saltwater swimming lagoon, tennis courts, sunbathing area, massage and Spa facilities, Tiki Bar, and a gourmet restaurant with a variety of modern and local dishes. All of the rooms have views of either the ocean or the beautiful nearby mountains, and feature refrigerators, cable TV, and other expected amenities. The location of this resort provides quick and easy access to the nearby harbor for diving and fishing excursions. At such a reasonable price for all that this hotel has on offer, it's a great value in a great location. Travelers are not at all disappointed with the quality of the facilities and accommodation at this Sharaton, as one would expect from the name. With a private beach, on-site golf courses, an adjacent shopping area, gorgeous swimming pool with a waterside and whirlpools, full Spa with facial and body treatments, and a large fitness center, visitors can't go wrong at the Sharaton Kona Resort & Spa. Rooms are appointed with all expected amenities which include luxurious toiletries, cable TV, refrigerators, and more. The grounds also include restaurants and various lounges for relaxation. The resort is only a short drive south from the town of Kona, and nearby attractions include the Kailua-Kona harbor, the southern tip of the island of Hawaii, Volcanoes National Park. Located about 15 minutes north of the Kona airport, the resort area of Waikoloa is host to several large hotels as well as shopping and dining amenities. The Waikoloa Beach Marriot is a first class establishment at reasonable prices. The beautiful facilities were designed to blend into the surrounding paradise-like landscape. Walking into the front door leads you through the open-air lobby which overlooks the infinity-style swimming pool and provides views of the nearby gardens, lagoon, and private beach. The huge property boasts meandering trails through a lush landscape with exotic plants, lava rocks, and lagoons. The private beach surrounds a cove which is home to a small coral reef hosting various tropical fish and sea turtles. Swimmers with snorkels or goggles can simply take a few strokes into the water and admire the underwater views, and then stroll up to the delicious restaurant only a few minutes later. The on-site Spa provides massages, facials, and other to-be-expected pampering experiences. Rooms are well designed and have a luxurious feel all to their own. With the usual set of toiletries, cable TV, refrigerators, coffee machines, patios and balconies, and more. The activities desk can arrange most types of excursions around the island, including dive trips. The Hilton at Waikoloa is a large resort worthy of the term "resort complex". This family-friendly behemoth of a hotel offers literally everything. If the private beach isn't enough, head over the dune to the private sunbathing area by the lagoon where you can rent watercraft. Or you could snorkel in the lagoon, as it is filled with plenty of tropical fish and sea turtles. Don't forget about the "dolphin encounters" pool, where kids and adults alike can watch feeding sessions and swim with the dolphins! This resort is large enough to warrant a tram system, which is fun in its own right, to take you from your room to the various pools, restaurants, tennis courts, golf courses, and garden paths. The Spa and gym live up to Hilton standards, as do the rooms themselves which include cable TV and refrigerators. There's no reason to ever leave, but if you do, the hotel is not far from the town of Kona or other nearby sites and activities. As one of the less expensive options in Kailua-Kona, the Kona Seaside Hotel offers a great location in town, nice amenities, and easy access to many of the island's attractions. With numerous shops and restaurants at your doorstep, this in-town hotel can't be beat as far as location goes if you're looking to see some historical sites, do some shopping, and eat some great local food. The hotel itself offers nicely decorated rooms with balconies, gardens, refrigerators, and Wi-Fi. The on-site restaurant serves seafood at reasonable prices. Two pools allow for relaxation and fun, and the hotel nightclub lets guests party into the night. Don't let the goofy name fool you, this fairly large hotel in the middle of Kailua-Kona offers numerous features at a reasonable price. It's in the heart of town but also near the beach. Within walking distance to many of the town's shops and restaurants, visitors can find anything they need just a few minutes away. The hotel offers free breakfast, plus a pool and laundry facilities. Rooms also include free Wi-Fi, a perk rarely found amongst higher-end hotels these days. Cable TV, toiletries, and other standard features are included in rooms as well.